In October 2015, British MP Daniel Kawczynski said it was terrible that the UK was cancelling a $8.4 million agreement to modernize Saudi Arabia’s prison system (because of human rights problems). Kawczynski, a Conservative, is leader of the All-Party Parliamentary Group for Saudi Arabia. Before then, important people in Britain, the US, Canada and Australia always said: ‘Saudi Arabia is our friend. They know about the public executions and the medieval floggings; they know women don’t have basic rights; they know the secret and religious police control the people, and that the legal system is controlled by what the royal family want; they know that Saudi Arabia is one of the last absolute monarchies in the world and really a dictatorship, and that it produced most of the 9-11 terrorists. But Saudi Arabia is our friend. John Kerry (US Secretary of State) recently said the US supports Saudi in its military action in Syria and in Yemen. But, as well as security, there is also money. For a long time, Saudi Arabia has had a lot of cheap oil. This has helped the economic growth of the West. Now there is other fuel, eg. shale, and the price of oil is falling. So Saudi Arabia does not get so much money from oil. But they still spend a lot of money on weapons. In 2014 it became the biggest buyer of arms in the world. In 2015 they bought about $9.8 billion of weapons – that helped make money for the arms industries in the US, the UK, France and Canada. In 2015 they bought more (to bomb Yemen and Syria) eg. $1 billion of US bombs between July and September. Saudi imports a lot: beef, barley and buses from Australia; food, healthcare and engineering from New Zealand/Aotearoa. Saudi gives a lot of well-paid jobs to Westerners eg. Canadian universities recently started men-only branches of their universities in Saudi Arabia. Rich Saudis (princes and business owners - often the same) use the financial services in London and New York. They have extra secrecy. Everyone can find out how much debt China has in US dollars. But Saudi’s money is a state secret, in the US and in Saudi. Mohamed bin Nawwaf bin Abdulaziz, Saudi amabassador to London, said we have Saudi ‘private business investments’ in the UK of $128 billion, so the media and parliament should not be negative about Saudi. Al Saud family money also supports culture and education eg. they give money to Oxford University, SOAS and the London School of Economics in Britain; Melbourne, Griffith and University of Western Sydney in Australia; and, in the US, someone from Saudi Arabia recently gave $10 million to Yale Law School. Saudi money goes to new mosques and community centres; maybe $100 billion has been given to promote Wahhabism in other countries. But maybe most shocking is that British and Saudi Arabian governments agreed to swap votes in the UN to make sure Saudi got a place on the UN Human Rights Council. Now Saudi chairs this council. For many years the international media was not very interested in Saudi Arabia. Then, in early 2015, King Abdullah died. His 79-year-old brother Salman became king. 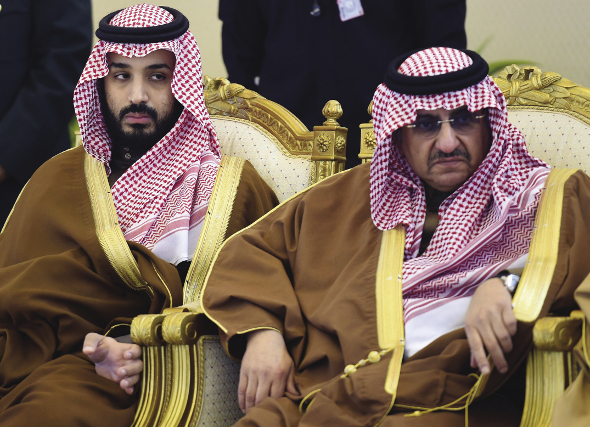 Soon everyone understood that Salman was ill, and his 29-year-old son, Mohammad bin Salman, was in control. He is Defence Minister and Deputy Crown Prince. People say he is a ‘pop idol’ prince – young Saudis love him – and ‘the most dangerous man in the world’. Many Saudi princes go to other countries for education, but he has never studied abroad. In March, MbS (as people call him) ordered the bombing of Yemen. He wanted to remove the Shi’a Houthi rebels and to put back Abd Rabbuh Mansour Hadi, who was the Sunni leader before. 6,000 people have died, even hospitals have been bombed and Yemen now has very little food. International charities and human rights groups have criticised this. After King Salman came to power, there has been more control in Saudi Arabia eg. executions in 2015 were the highest in 20 years. Then, early this year, they executed 47 ‘terrorists’ in one day, including the important Shi’a cleric Nimr al-Nimr. Shi’a communities across the world, were very angry. In Iran, protesters set fire to the Saudi embassy in Tehran. There has been discrimination against Shi’a people in Saudi Arabia for a long time. They cannot hold positions of state. Teachers teach Saudi children in school that Shi’a are non-believers. The government says that Saudi’s Shi’a communities support Iran, but experts say there is no proof. Saudi social media talks about arguments in the royal family, around MbS. He talked to The Economist about his neoliberal plans eg. to privatize the state oil company, ARAMCO. And he sounded like he controlled the economy too. But the Saudi economy is in trouble. This year it has a $98-billion budget deficit. The oil price has gone down a lot – now less than $30 a barrel. 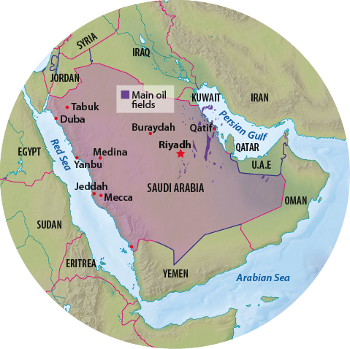 Saudi needed a price of $100 per barrel for its budget. They have started austerity. The government is worried – money solved all their problems in the past. The war in Yemen costs Saudi Arabia $6 billion a month, and it does not look like the Houthis will give up. Riyadh is not happy that the West is now closer to Iran (the sanctions have stopped). Then there is the threat from Islamic State. Last year there were 15 attacks by IS militants in Saudi Arabia. An attack on a Shi’a mosque killed 23 people. IS caliph Abu Bakr al-Baghdadi has spoken against the Al Saud family. He says they are betraying Islam. It’s ironic: the ruling family controls the country because it follows the pure fundamentalist form of Islam called Wahhabism. But both al-Qaeda and Islamic State developed from this Saudi Wahhabism. People often say the Saudi government gives money to terrorism, directly or through the mosques. IS is not allowed in Saudi Arabia and it’s illegal for Saudi nationals to go other countries to fight for IS. But maybe there is public support. A 2014 survey showed about five per cent of Saudis support IS. But after the Paris attacks, most tweets supporting the killers came from Saudi Arabia. The Defence Minister said Saudi is going to lead a group of 34 Muslim states to fight terrorism. But most people do not think this is true. So the idea that Saudi Arabia is a reliable friend for the West depends on three ideas (that might not be true): that Saudi Arabia is keeping the region stable; that it really wants to stop Islamist terrorism; and that it can stop it. Stop selling arms. Belgium and Sweden have done this – and lost money. A UN report showed that the Saudi coalition are bombing and starving civilians in Yemen. So there is a lot of pressure on the Canadian government to say why it is selling them $15 billion of armoured vehicles. US senators say they need to know more about arms sales to Saudi Arabia. In Britain, a group of MPs from all parties says they need to stop selling arms. And European MEPs have just voted for the EU to stop selling arms to Saudi Arabia. Many powerful people still want the arms selling. But now the big arms sellers, like Britain, are breaking national and international law by selling arms for use against regular citizens in Yemen. So this could change. There is always a strong moral argument against selling arms. But in the case of Saudi Arabia, there are strong strategic and security reasons too. Saudi Arabia has too many arms. This is making the region unstable. Fighting against Iran by bombing Syria and Yemen is very destructive. Saudi is arming and supporting the most extreme groups in Syria (eg. Jaysh al-Islam). It is making people more extremist. This helps groups like IS. And Al-Qaeda is now getting more important again in Yemen, thanks to the Saudis. David Cameron says selling arms to Saudi Arabia keeps us safe. But it doesn’t keep anyone safe. It increases the risk of terror attacks and makes the refugee crisis worse. Western supporters of the Saudi government often say that it is better to work on human rights if they have a friendly relationship. But they have done nothing so far. If Western leaders really want to be friends with Saudi Arabia then they should help the people. 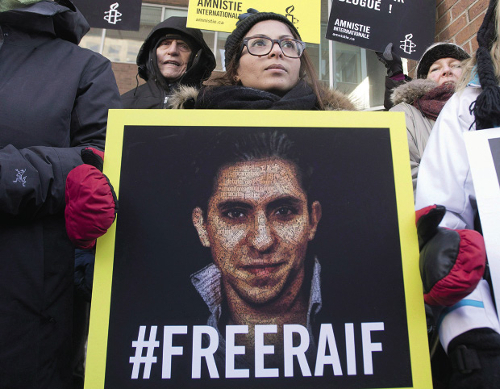 They could help people who simply want basic freedom; or the young blogger Raif Badawi, who got 1,000 lashes for saying what he thinks. His book is 1,000 lashes: because I say what I think. Maybe that’s the Saudi friend we should have and defend. NOW READ THE ORIGINAL (and see the sources): http://newint.org/features/2016/03/01/our-friends-saudi-arabia-and-the-west/ (This article has been simplified so the words, text structure and quotes may have been changed). This page was last edited on 6 March 2016, at 18:13.